An Xbox 360 version of a Wii Remote style motion-controller has apparently been in development since last summer, according to MTV News. 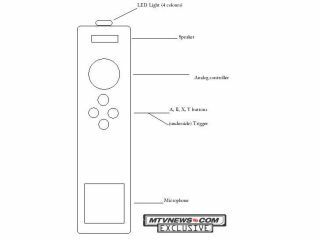 MTV News quotes “a developer who has been briefed on the project” who claims that Microsoft has been working on its own motion-controlled Wii Remote style controller since last summer. The source also adds that feted developer, Rare, “has been tasked with creating a unified interface and look for the controller”. MTV adds that it has confirmed Microsoft's active interest in developing a motion-sensitive controller with other (unnamed) industry sources. It would of course come as no surprise to learn that Microsoft was planning on adapting motion-control for use in future Xbox 360 games. In fact, it would be more surprising if the company didn't have any such plans in development. However, if the sketch of ‘Microsoft’s Wii Remote imitator’ provided by MTV’s source is anything to go by - which looks like something a two-year old knocked up in MS Paint - it would seem that there isn't too much for Nintendo to worry itself about. Microsoft, as ever, “does not comment on rumors and speculation" and Nintendo has yet to return our calls on this, so stay tuned for more as and when we get it. TechRadar has also contacted In2Games, developer of the GameTrak Freedom motion-control tech for Xbox 360 and PS3 for comment. We can confirm that the above story on MTV has nothing to do with In2Games.